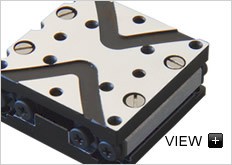 This Low profile piezo positioner was recently improved and is now available as the Q-522 linear piezo stage. It is a low cost, compact linear stage and is available in closed loop and open loop. The optional linear encoder provides nanometer repeatability. It is based on a compact piezo stick slip motor and a precision machined steel slide, which allows for very smooth motion and travel ranges of 1/2 inch and 1 inch. Vacuum compatible and non magnetic versions are available on request. .